From a young age our society teaches children to see animal products as objects, and forget their source. 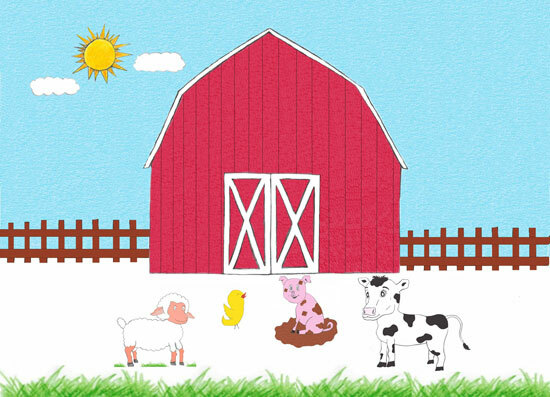 Vegan Adventures with Barnyard Friends does the opposite, teaching kids about the lives and characteristics of animals through stories and activities. There are five animals, each with their own story that, although short, allows you to connect with them as a living being. Every story is followed by activities that children can do on their own or with guidance (depending on age and ability). The book also includes recipes and interviews of vegan children. My little one and I took a few of days to read through the entire book and do all the activities. As we read through Vegan Adventures, my little one was compelled to ask questions, and wanted to learn more. He would even point at text in the mazes to make sure I read every detail because he wanted to make sure I didn’t leave anything out! The discussions that arose from reading Vegan Adventures was a great way to talk about the animals themselves, and learn about what they would do in a day if it were not for human intervention. The book covers animals used by humans for food and clothing, as well as those that swim in our waterways. Vegan Adventures is written in a way that we can talk about the lives of these animals without going into horrific details about the way they are processed, raised, or slaughtered. The book sparks language that caregivers can use in a discussion that would evoke compassion from their children, rather than terrorize them. The simplicity of the activities at the end of each story allowed my little one to learn new words easily, and still complete them on his own -except for the crossword puzzles, which we found to be a great activity to work on together. Having these activities at the end of each story not only encouraged discussion about each animal, but also made it easier to process the information and take breaks. The recipes at the end of the book were incredibly simplistic but delicious -which means even kids can prepare and enjoy them! Hurrah! Simple vegan recipes for families to happily add to their staple menu. After reading the animal stories, my little one enjoyed looking through the interviews of Vibrant Vegan Kids. He liked seeing their photos, reading what their favourite foods were, and finding ones who shared his preferences. When asked what he thought about Vegan Adventures, my little one replied, “I liked learning about the animals”. And that is certainly true. He asked me so many questions about them! As a parent, I liked the discussion that arose naturally as we read through this book without feeling the need to get into any heavy or gory details to explain why the animals deserve to live a life free of cruelty. I, personally, loved the inclusion of activities at the end of each story. Vegan Adventures is a book that youth can enjoy reading while practicing what they learned in simple but fun activities to help them develop the compassion and language to ask more questions about animals used in agriculture. I would definitely recommend this book to caregivers who want to teach their little ones about animals using little bites of information and story-telling. No matter the child’s current diet, they can enjoy going on Vegan Adventures with Barnyard Friends. For more information on Vegan Adventures with Barnyard Friends, please visit the website. Amanda lily is a vegan Health Coach and Personal Trainer that offers coaching to those who want to adopt a kinder diet, but struggle with the logistical and social challenges of fitting it into their daily lives. Through workshops and virtual coaching with one-on-one and group sessions, she helps people all over North America find a way to bring their choices more in-line with their values.